Being the Marketing Executive at IndigoVerge, I am responsible for the administration of multiple Twitter accounts. Still, I’ve managed to optimize my tweeting environment so posting and monitoring tweets is quick and efficient, and I wanted to share with you 5 tweeting tools I wouldn’t make it without. 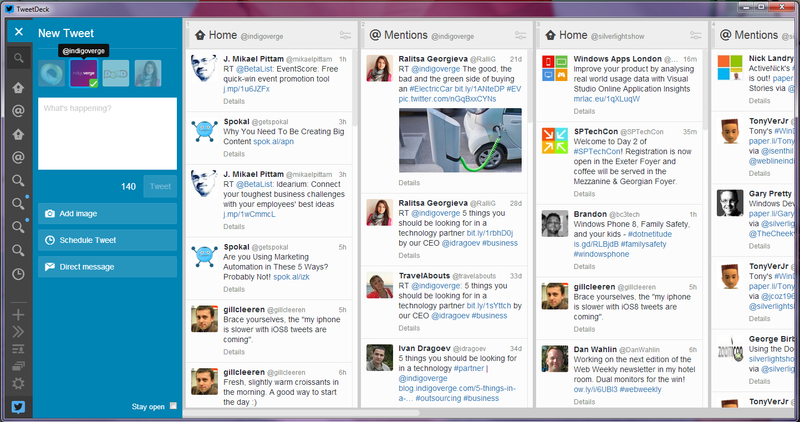 TweetDeck is a great assistant when it comes to optimizing your Twitter experience. 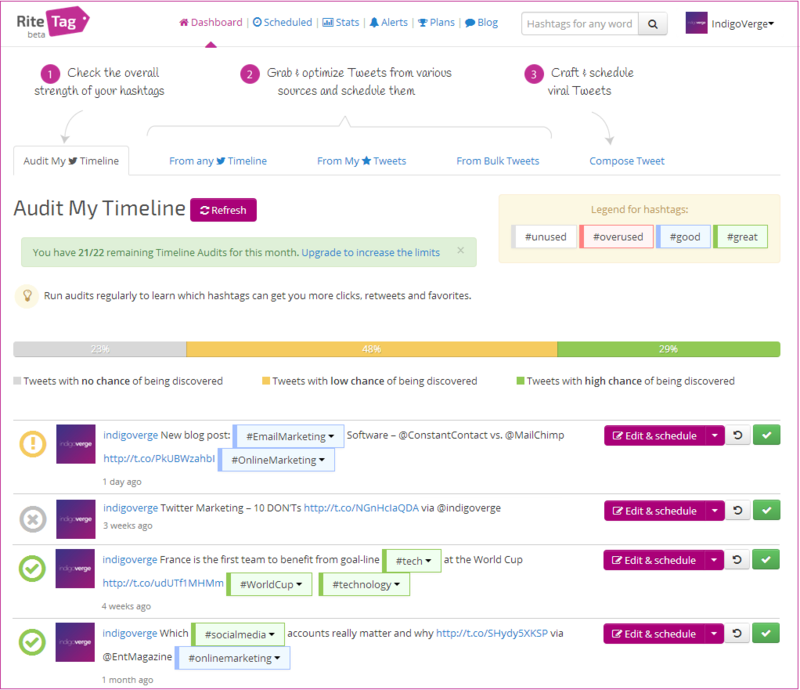 It allows you to manage and monitor multiple accounts, to schedule tweets, to save and follow topics (hashtags) that you are interested in, to track your mentions… and all that – in one single place. I personally prefer the desktop version of the application, but it also has a mobile app and Chrome extension. The main benefit of TweetDeck is that you can easily switch between different accounts, without the need to log in / log out. Everything you usually do in Twitter (tweet, reply, follow/unfollow users, send direct messages, search hashtags, etc.) you can do it in TweetDeck, too, but in a much more organized way. 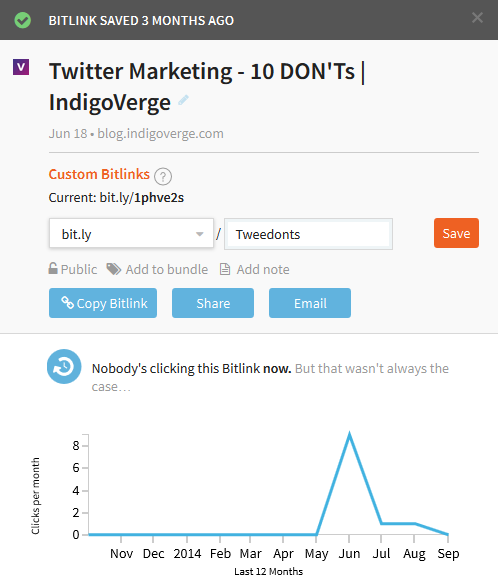 Bit.ly is a URL shortening service that is simply must-have, considering that a tweet can only have 140 characters. Of course Twitter is also auto-shortening your links, but with Bit.ly you can get extra options: you can have a branded short domain, track clicks and other stats for your bitlinks, customize the URLs, group the links in bundles, and search for past links. Your only “effort” is the initial configuration of the Buffer app – you need to install the browser extension, connect your Twitter and Bit.ly accounts, and set up the time-slots of your tweets. Once you have configured it, you can add content from right inside your browser. Simply click the Buffer icon (top right in the browser toolbar) while you are at the page you’d like to tweet. 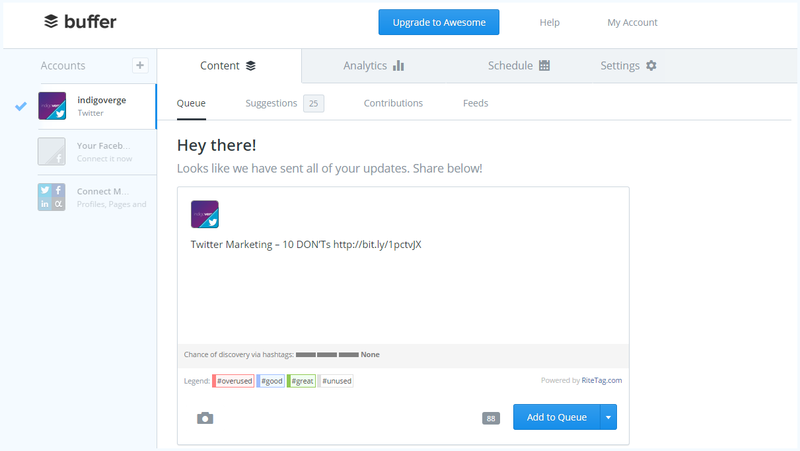 The standard Buffer share window will open so you can modify your tweet and place it in the next available time-slot on your updating schedule. RiteTag has 4 categories for the hashtags – unused, overused, good, great – which define the probability of your tweets being discovered. After you analyze your hashtags, you may craft and schedule your tweets directly from the tool. You can also use the tool to load tweets from your competitors, partners or opinion leaders so you can check their hashtagging and borrow some good ideas. As the name suggests, Who.Unfollowed.Me is tracking the Twitter users who unfollowed your account. In addition to this core functionality, the tool is also tracking your new followers, who you aren’t following back & who aren’t following you back. Based on these stats, you can decide to unfollow/follow certain accounts and you can do this directly in the platform – there is a button next to each tracked username. There are dozens of other tools that can enhance your Twitter experience, but if you are a newbie I suggest you to start with these 5. Try them for a few weeks, experiment as much as you can and choose the ones that fit you best. Happy Tweeting and feel free to share your top 5 Twitter tools!